Whether you’re a fellow food blogger, another type of blogger, or someone who’s simply looking for a few tips to batch work, this post is for you. After six years of working (and blogging) at the last minute and without a determined workflow or approach, I laid out a plan of action and began batching my work. In the year that followed, not only did my productivity increase, so did my overall sense of joy and fulfillment. Below you’ll find my hustle-free tips + tricks for batching work and working ahead. For years, decades even, this was the word I used to describe my work ethic. Procrastination defined my school-age years, my college years, my grad school years, and many of the work years that followed. I considered myself to be someone who not only functioned under the pressures of procrastination but thrived under them. As it turns out, there’s a neurobiological reason for this. The problem starts with our beliefs* around inspiration and action. Many of us wait for inspiration (or motivation) to strike before we initiate action. Then, once the inspiration is there, we act. This would all be well and fine if inspiration was predictable. But it’s not. Inspiration is one of the most elusive, convoluted emotions. Sometimes it’s present in abundance and for no reason at all, other times there’s a direct and clear cause for it. But mostly, it’s a crapshoot. And for those of us who rely on inspiration to urge us to action, the path to task completion becomes a rocky, unstable, and exhausting one. So why do we keep procrastinating? And why on earth don’t we learn from our mistakes? When faced with an imminent deadline (i.e., a stressor), our brains release norepinephrine (aka noradrenaline) in abundance. Norepinephrine increases arousal, promotes vigilance, enhances memory formation, and focuses attention. Read: It makes us laser-focused superhumans. However, when we’re initially given a task—especially one with a roomy deadline—there’s no sense of urgency. Therefore, there’s no extra norepinephrine to encourage our minds to focus and hunker down on the task at hand. BUT, as the deadline nears, norepinephrine surges and motivates (or inspires) us to action. And because there’s so much extra norepinephrine floating around, the action we take feels especially good because it’s ultra focused and in the “flow zone,” too. Because it feels so good to be laser-focused, procrastination ends up reinforcing itself. Essentially, procrastination feels bad until it feels good. And because our brains can be a bit primitive, a short blast of feel-good neurotransmitters is all we need to forget about the weeks of self-loathing leading up to those few fleeting moments of focused bliss. 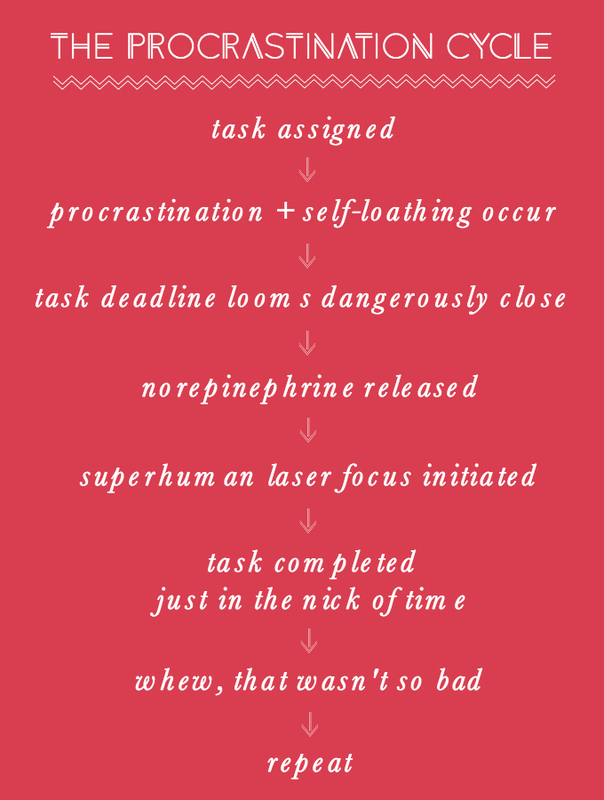 So, how do we override the procrastination cycle? We plan ahead and leap to action. Basically, we act before we give ourselves a chance to think too much. We just do. And from a doing place, the feel-good neurotransmitters and flowy, in-the-zone states will follow. Of course, this is all easier said than done and it doesn’t hurt to first set the stage for happy, healthy, and aligned minds and hearts as best we can (e.g., nourish ourselves, sleep well, meditate, write to our intuition, etc.). But if we can trust in the process and spur ourselves to action before our minds give us 1,000 reasons to avoid, we will be rewarded. Not only with focused states of flow, but also with contentment, peace, and joy. Because it feels good to have a handle on things. It feels good to face our tasks rather than avoid them. It feels good to give ourselves a pat on the back for a job well done rather than beat ourselves up for yet another task untouched. Procrastination doesn’t just hurt you, it hurts us, too, because it deprives everyone of the talents and perspective that only you have. So what do we do? We start. And once we’ve started, inspiration will find us. We don’t have to sit around waiting for inspiration to magically strike. We just need to be brave enough to take that first step without it and then wait for its fashionably late arrival. I’m convinced that inspiration seeks those who dare to move forward without it. And if inspiration never arrives, then perhaps we’ve found ourselves tangled up with a task that simply doesn’t deserve our attention. From there, we can regroup, regather, and realign ourselves with the path we’re truly and intuitively being called towards. In this way, even unrequited inspiration is purposeful. Now that we’ve conquered procrastination, where do we go from here? We plan, prepare, and batch. A quick note before we dive in to the nitty gritty. 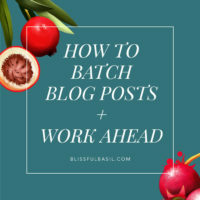 For the purposes of providing you with tangible, clear examples, I’m going to speak exclusively to how I plan, prepare, and batch blog work, but these strategies can certainly be generalized to other types of work. Although a bit rigid and all-or-nothing in its approach, there’s certainly some truth to this cliché. Planning allows us to take a loosely formed idea or vision and break it into tangible, approachable milestones and tasks. Because simple gets done, and complicated gets procrastinated. Typically, I work two to four weeks ahead of schedule (sometimes more). 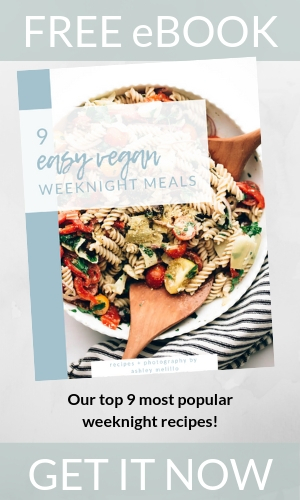 Since I post recipes twice a week, this means that at any given time, I have four to eight posts fully written, edited, and scheduled in advance. If you follow me on Instagram, you may have seen my Stories post in late November where I shared that I’d written and scheduled 17 posts in advance in preparation for the arrival of our first little one. Working that far ahead gave me a full two-month buffer in which I could be (and am) almost completely hands-off when it comes to work. A self-created, full-time maternity leave, essentially. It took me nearly four months of dedication to work that far ahead, but it was absolutely worth it. I’ve found that the easiest way to build up a buffer of completed blog posts is to add one additional post to my workflow each week. For instance, prior to working ahead of schedule, I’d test and photograph two recipes per week. To begin to create a backlog, I stepped this up to three recipes per week. Thus, by the time one month passed, I was already working a full two weeks ahead of schedule. You could certainly take a more rigorous approach if you want to launch yourself even further ahead. Do what feels right for you. For the purposes of this blog post, I’ll speak to working four weeks (or about one month) ahead of time. I have a running Google spreadsheet that I use to document any and all recipe ideas that come to mind. For on-the-go recipe brainstorming, I use the Notes application on my phone. Whenever a recipe idea pops into my head, I toss it into the spreadsheet without judgment. Some of the strangest ideas end up being the most original and wonderful, so I try not to filter too much on the front end. In addition to on-the-fly recipe brainstorming, I sit down for a two-hour recipe brainstorming session about once a month. 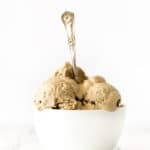 I’ll often begin this process by thinking of a type of recipe (e.g., brownies) or a particular ingredient and category (e.g., smoothies with cauliflower) or maybe even a flavor (e.g., eggnog) and let any and all ideas flow onto the page from there. The ideas end up being loosely connected and potentially even redundant, but typically I’ll end up making just one or two ideas in a series of many similar ones. 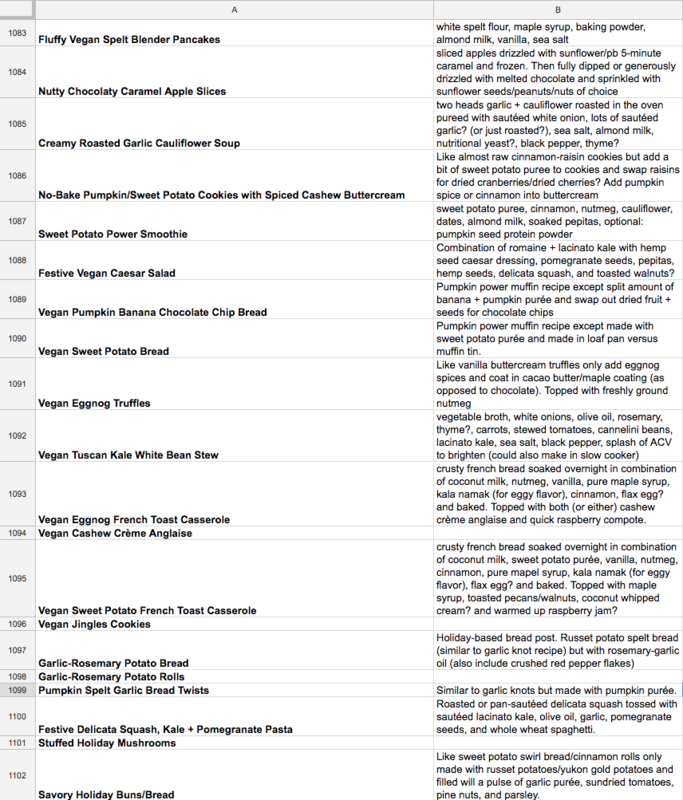 Hence, there are literally hundreds of unused recipe ideas accumulated in my recipe spreadsheet. I love this because when I’m in a recipe brainstorming rut, I simply turn to some of those unused ideas to get me through until the creative juices are flowing once again. As I brainstorm general concepts, I also jot down a very loose idea of what the recipe will look like, including ideas for ingredients as well as techniques. See here for a screenshot example. Again, the key is not to judge, tinker, or edit as the ideas flow. Let the typos happen, get your ego out of the way, and allow the transfer of ideas to be as fluid and intuitive as possible. One of my favorite resources for idea generation is the book Accidental Genius (←affiliate link). At the start of each month, I spend a few hours planning out when I will test, photograph, and write the following month’s recipes. Essentially, I create an editorial calendar. 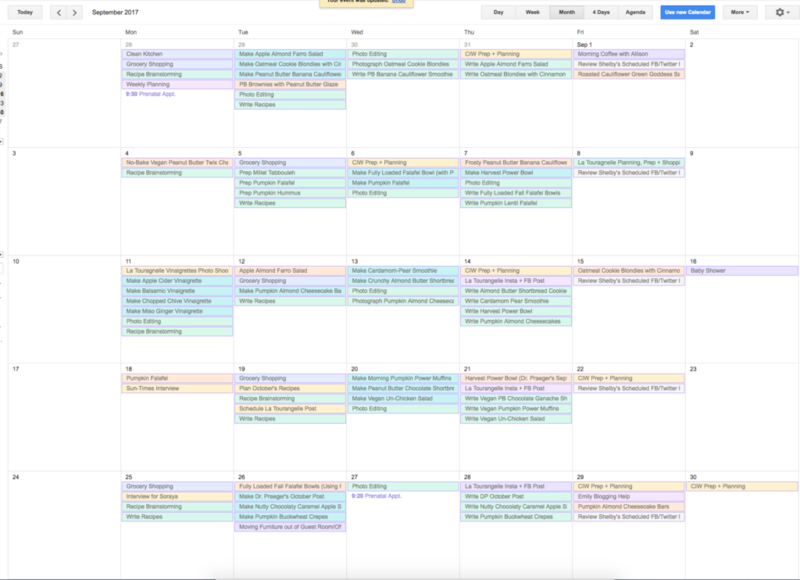 I use Google Calendar to chart and document all of this with color-coded task items and to-do’s. See here for an example of one month. Monday: Make a grocery list based on which three recipes I’ll be testing and photographing that week. Grocery shopping. 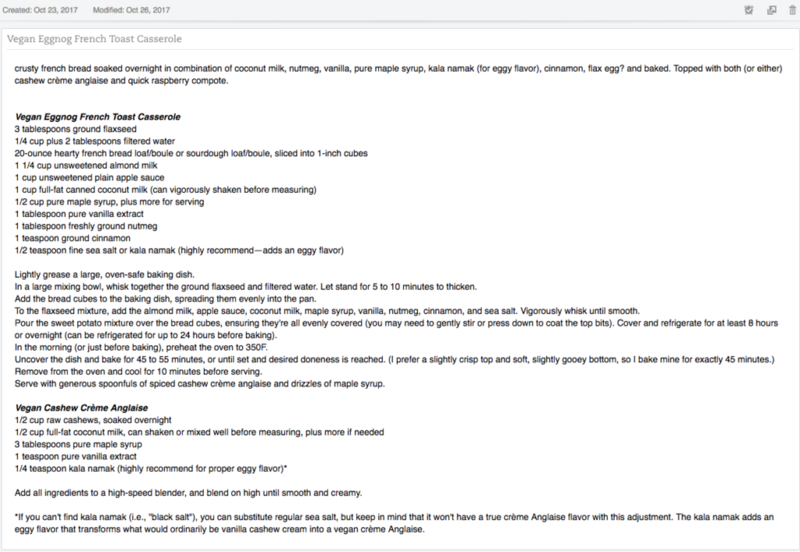 Transfer recipe idea notes (from spreadsheet mentioned above) to Evernote and write out a rough draft for each recipe (see here for an example). Emails and other weekly to-do’s, such as bills, comment catchup, etc. Tuesday: Recipe testing and photography. Typically, I’ll dig into recipe testing on Tuesday, especially for recipes that I know will require several rounds of testing (e.g., vegan gluten-free baked goods). Email social media information for the day’s blog post information to my virtual assistant (she schedules Twitter and Facebook posts for me and also submits recipes to food photo sites, such as Foodgawker, Finding Vegan, etc.). Side note: I hired a virtual assistant to help me with social media over a year ago, and it’s been one of the best business decisions I’ve made to date. It’s freed up about five hours of time each week that I’ve been able to reallocate to bigger projects. Wednesday: Recipe testing, photography, and photo editing. Once I’ve finished testing and photographing recipes for the week, I upload all of the images to Lightroom and get to work editing. I also run a second, fine-tuning round of edits in Photoshop. Editing three recipes worth of images can take me anywhere from two to five hours depending on the complexity of the edits. Upload images and recipes to draft blog posts in WordPress. Add necessary tags, categories, and SEO information to posts. Thursday: Writing day (my favorite)! Write a draft of each blog post. Then, edit and schedule the posts in WordPress. If I’m feeling extra productive, I’ll go ahead and pre-schedule each Instagram post in advance using Iconosquare. I also use Thursdays to complete any interviews and to chip away on work for special projects, presentations, etc. Friday: Flex day. Email social media information for the day’s blog post information to my virtual assistant. Sometimes I have an overflow of work that I complete (e.g., putting the finishing touches and edits on that week’s posts). Other times, I use Fridays for new business brainstorming. Generally, I take a half day and give myself the afternoon off, because I work 10+ hour days Monday–Thursday and also work a few hours on Sundays, too. This might not seem like it belongs in the “Plan + Prepare” category, but it’s impossible to talk about productivity without at least mentioning the power of ‘No’. As a high self-monitor, I’m a natural born people pleaser. It’s hard for me to say the ‘N’ word. 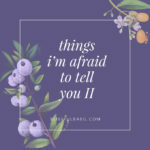 But it wasn’t until I started to say ‘No’ to many things that I finally found the time and space to say ‘Yes’ to the tasks that allowed me to flourish creatively. But trust me, you’ll burn yourself out saying ‘yes’ to all or by always making decisions on a case-by-case basis. Not to mention the fact that if you say ‘yes’ to everyone else’s ideas, you’ll leave little time to say ‘yes’ to your own. I first stumbled across the concept of batching work in Shaa Wasmund’s book Do Less, Get More (←affiliate link). On the way home from a bucket list trip to South Africa, I was struck by sudden inspiration to completely change the way I’d been approaching work. I was tired of procrastinating. Tired of doing stressful things at the last minute. In the midst of my end-of-vacation crisis, I found Shaa’s book on the bestsellers table at a small airport bookshop in Amsterdam. I nabbed a copy without hesitation and tore through the first half of the book on the flight home. Not long after arriving home, I finished the second half. Without diving too deep into the nitty gritty, the book provides countless tips for enhancing not only productivity but also joy and work-life balance. Essentially, it teaches us to work smarter not harder and to be more intentional in the way we approach tasks. Of all the concepts mentioned in the book, the idea of batching work stood out to me the most. Simply put, batching work (or time) means that you set aside chunks of time to complete series of similar tasks. For instance, instead of spreading your recipe testing and photography out throughout the entire week, you dedicate just one or two days to it each week. Instead of writing bits and pieces of blog posts throughout the week, you set aside a dedicated “writing day” each week and write several posts in a row. Batching time is effective because it offers us the cognitive space to be consistently focused on just one thing. Being focused on just one thing leads to increased productivity and quality of work. It also brings more fulfillment and joy to the work we do. It’s easy to feel overwhelmed and burnt out when we constantly spread ourselves thin amongst and jump back-and-forth between many tasks at once. However, when we give our minds just one type of task to linger with for a set amount of time, magical things can and do happen. You can use the batching approach for almost anything—paying bills, replying to emails, returning phone calls, weekly planning, running errands, organizing, etc. EMAILS. Email can easily become one of the most consistent and persistent distractors throughout the work day. Did you know that our brains receive a hit of dopamine (the neurotransmitter associated with the brain’s reward system) every time we check email? Talk about a self-reinforcing habit. And while it feels great to receive that dopamine buzz, it feels crappy to be constantly distracted by a never-ending influx of everyone else’s to-do’s for you. Because when it comes down to it, your email inbox is just that: A list of other people’s to-do’s for you. If you can swing it, I recommend checking email just once or twice a day and giving it your undivided attention during those checkpoints. I tend to feel anxious if I don’t do a morning email sweep, so I check it once in the morning and once at the end of the work day. When I’m waiting to hear back on something time-sensitive, I add a midday check, too. The most important thing is to get in and get out. Whatever you do, avoid leaving your email tab open all day. SAYING NO. As mentioned above, learning to say “no” is imperative to our ability to work ahead and avoid burnout. Now, I’m not suggesting you go on hour-long sprees of blindly saying “no” to everyone and everything you encounter. Rather, I’m suggesting you “batch your no’s” by determining which opportunities you consistently say “no” to. For example, I receive nearly 100 press releases and product pitches each week, and I politely decline all of them. Most of the product pitches offer free samples in exchange for social media or blog coverage. A few years back, I ran giveaways on my blog for those products that were a good fit, hence every email pitch I received left me with a decision to make: Is this a ‘yes’ or a ‘no’ opportunity? After a few months of this, I found myself utterly overwhelmed. And quite frankly, I was also feeling used and a bit irritated, too. Each of those giveaway posts required anywhere from 8–10 hours of work to photograph, write, promote, manage, etc., and brands were often picky and demanding despite the hours of free work I was doing for them. What a liberating philosophy! And one that turned this people-pleasing ‘YES’ gal into a decisive, yet polite, thank-you-but-no-thank-you boss woman. The key, of course, is to decline opportunities in an appreciative manner. This isn’t about shooting people down, it’s about graciously passing on most opportunities so that you can maintain space for the ones that truly, deeply fulfill you. 1. 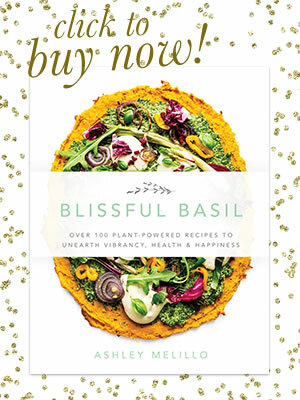 Offers to guest post on Blissful Basil. 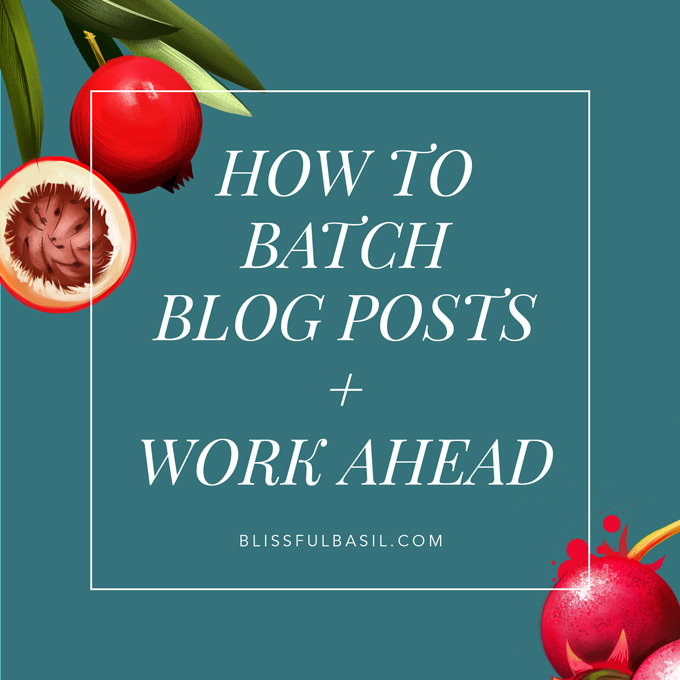 I receive so many kind requests from other bloggers wanting to guest post on Blissful Basil each week that it’s simply too time-consuming to sort through them all. Plus, I very much enjoy having full creative control over this space. 2. Requests to include links or infographics in posts. Most of the time, these pitches are super spammy and aren’t at all relevant to the content I share anyway, but even for the more legitimate requests, it’s simply too time-consuming to make decisions on a case-by-case basis. 3. Pitches to create recipes in exchange for free products. It takes me anywhere from 8 to 15 hours to test, photograph, write, and promote one recipe post. To me, that amount of time is far more valuable than four bags of free pasta, and I’d much rather write and create for myself with no strings attached than have to abide by someone else’s guidelines. Having said this, working with brands that genuinely support this space and are willing to sponsor posts is an entirely different story. It’s expensive to run a website, and working with brands I truly love in a collaborative, mutually beneficial capacity allows Blissful Basil to continue to exist. Free swag does not. Bottom line: Determine which opportunities you consistently say ‘No’ to so that you can consistently say ‘Yes’ to the work and life opportunities that fuel you. MONTHLY PLANNING. As mentioned above, I set aside a chunk of time each month to plan out my editorial calendar for the following month. At that time, I also map out my workflow for the month. RECIPE TESTING. I set aside one to two days each week to recipe test. This gives me plenty of time to test and re-test without interruption, especially for more temperamental recipes. PHOTOGRAPHY. Once I’ve finished recipe testing a week’s recipes, I batch photograph them. I remake each recipe and snap process shots as well as images of each completed recipe. PHOTO EDITING. Once I’ve finished testing and photographing recipes for the week, I dedicate a full afternoon to photo editing. I sort through and edit all photos in Lightroom and then export them and fine-tune edits in Photoshop. Once I finish editing all images, I create draft posts in WordPress for each recipe post and upload the photos and finished recipes. I also add tags, categories, and other pertinent SEO information to the draft posts at this time. That way, by the time Thursday (i.e., Writing Day) rolls around, all I need to do is go into each draft post and write the post content. WRITING. Thursday is writing day, and it’s my favorite day of the week. I typically set aside all of Thursday morning to write. 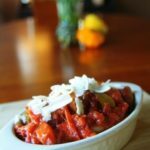 If the posts are straightforward recipe posts, I can usually write, edit, and schedule three posts in about three to four hours. For more complex posts, I often need all of Thursday and sometimes Friday morning as well. Of all the tasks I batch each week, I’ve noticed the greatest gains when it comes to writing. Perhaps because writing is so important to me, the stakes have always felt higher with it. In the past, it felt almost impossible to initiate writing tasks without sufficient inspiration. However, once I began setting aside a dedicated writing day each week, everything changed. The writing process now unfolds more effortlessly, and it’s so much more joyful and fulfilling. This doesn’t mean it isn’t hard work—it certainly is—but it’s the kind of hard work that’s incredibly gratifying. Thank you! This post is GOLD just like everything else you do! Thank you! Thank you! Congrats on baby! Such a great and thorough post. I love seeing your calendar and Evernote examples. I’m feeling inspired to rework my systems and plan for the month ahead. Thanks for sharing your process along with your great recipes. Love it! Thanks for sharing your process. It was super helpful! I really need to work on batching instead of spreading random tasks out all week and completing one post at a time. Thanks! That was SO helpful and inspiring! Thanks for laying out your process like that. Thank you so much, Ashley! As a new blogger, this was super helpful! Hi Ashley, thank you for sharing! 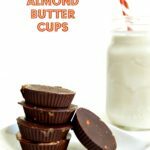 I find this blog post so helpful and I am going to start practicing batch work. It makes so much sense. I think sometimes we get caught up in the pressure of completing one post at a time, but I love the idea of scheduling out the week to concentrate on like tasks at the same time!! 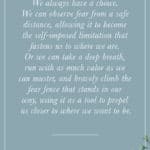 This post especially resonates with me because one of my biggest struggles is coming up with a blogging process that works best for me . I am constantly jumping from one thing to the next and many times I end up not completing anything which leaves me feeling unaccomplished and stressed. 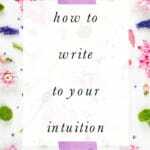 Your writing style and photos are so inspiring and I really enjoy following your blog! This is super helpful even for a super new blogger like myself. The batching of work will really help me balance my current job as I try to get my blog off the ground. Thanks so much! This is so helpful! Thanks you for taking the time to pull it together. Do you have any resources for finding a good VA? So glad you found it helpful, Katie! Upwork.com is what I used to find my VA—it’s an amazing (FREE!) service, and I can’t recommend it enough. Good luck! Thank you for this! It’s really helping me to start planning my blog via batching instead of doing a billion tasks every day. This post was so helpful! I learned so much and I can’t wait to use some of your blog planning tips in my daily blogging life. I can totally related to blog procrastination and then I feel scrambled and burnt out when I have to post a blog last minute. I am going to start using (and sticking to) an editorial calendar to plan everything. Hi, Stef! So glad you found the post to be helpful. I completely hear you on feeling scrambled at burnt out—never fun. Hope these tips bring a bit more peace and balance to your work life. This was a very helpful post in so many ways! I’ve gone through it at least 3 times and get more out of it each time. One question: what program do you use to write your posts in before you add them to your site? So glad you’ve found it to be helpful, Brenda! 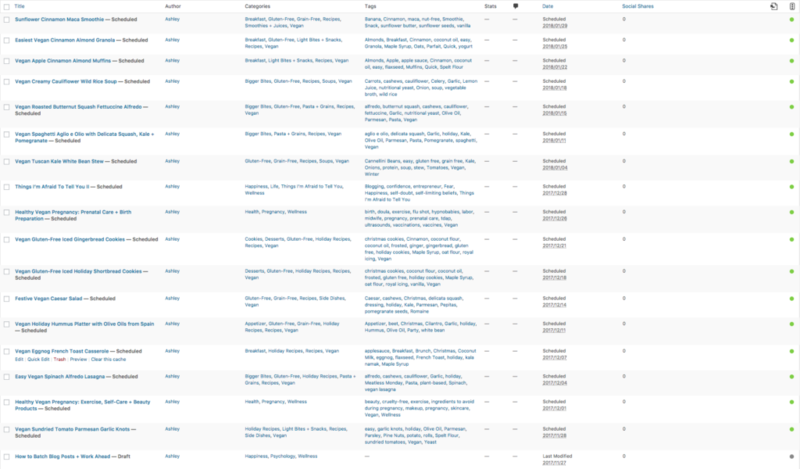 I draft my posts right in the WordPress dashboard, and I use Evernote to draft recipes and write recipe testing notes. Hope this helps!